It’s been wearing on me to the point that I can’t help but obsess over it. The endless eclipse hype got me. Now, I’m quivering with low-level anticipation. Questions remain: How bad will traffic get? Can a viewing of less than totality be satisfying? How will I know? Will I burn my retinas staring into the sun? Is there a chance the world, or maybe the U.S. can achieve enlightenment from the eclipse experience? 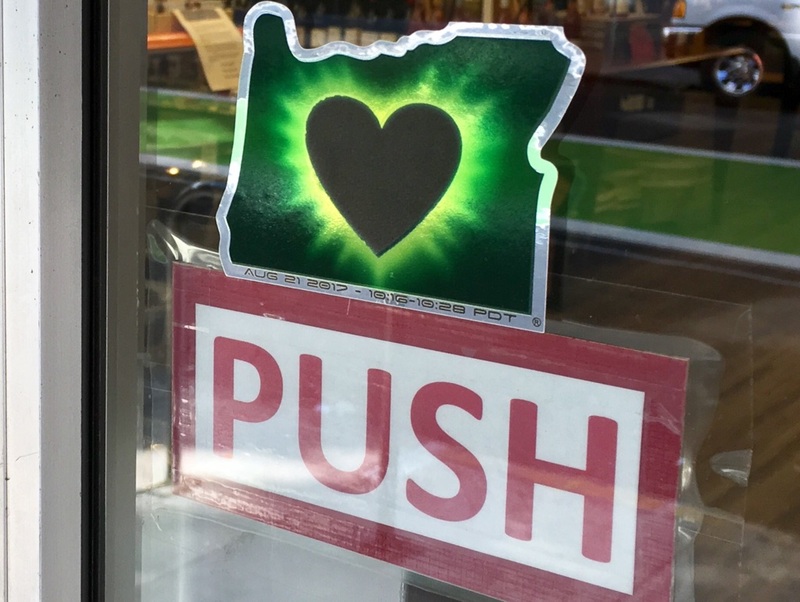 The Heart of Totality is on the sticker. It’s felt like a slow boil to this hysteria that’s happened over six weeks. The local news feels relentless with promos about tomorrow’s live coverage. An event like this must be a godsend in what can be a slow news month. NPR has covered the event from many angles running a couple of interviews with the most enthusiastic eclipse expert ever. We’re talking a guy who made plans three years ago to observe the event in Jackson Hole, Wy. At least he’s staying out of Oregon. They also ran a piece about movies that have included eclipse events in them. While this holds my interest, I have hype-fatigue. Oregon is going crazy. There have been hours of coverage on Oregon Public Broadcasting about the goings on in the state and the Eclipse Festival in central Oregon called the Symbiosis Gathering that has 30,000 attendees. Oh yeah and, as promised, I can probably choose to watch the solar eclipse live on one of my local TV channels. Buy a high and get glasses too. Looking through a sample pair of glasses at Paxton Gate I was surprised that I couldn’t see a thing. It dawned on me. I knew they prevented eye fry but I thought of them as cool and maybe strong sun glasses. My out-of-town guest explained that the glasses were for looking at photons. My God! Everyone’s a scientist. My brilliant neighbor Paul was on his way to meet his brother who was camping in central Oregon. He was leaving the Thursday before the eclipse allowing for a few days to be stuck in traffic without missing it. There have been reports of long traffic back ups and fuel shortages in Prineville, OR and miles around it. Before he left, my neighbor had me considering where the sun would be in relation to my house in case I decided to stay put and not drive anywhere for a few extra degrees of totality. From our observation where the sun was at around 11:30AM that day, he determined our best vantage point was through the sky light in our upstairs bathroom. Again, it’s nice to be surrounded by scientists. The Furnace guy told me that the Holiday Motel, not to be confused with the Holiday Inn chain was charging $999 for a room he said was only worth about 30 bucks. There’s no time to substantiate this but I’m sure if you needed a room and there’s one available at this price if you coughed, sputtered, hemmed and hawed you could talk them down six or seven hundred dollars. It is a motel room in Portland; not in the Path of Totality. Where are you supposed to watch the eclipse? From a motel parking lot in an industrial section of town? We also heard about plans someone made to go to a minor league baseball game scheduled to start at 9:30 Monday morning. This is going to be the only sporting event that anyone knows about where play will have been suspended for the eclipse. The maker of this plan is leaving the house at three in the morning to ensure on time arrival at the game about fifty miles away in the Salem/Keizer area . The panic to find a pair of glasses ended when the folks at Natural Grocers hooked us up with two free pairs. We were more than willing to sign a waiver for them. The glasses were getting scarce, and we had been joking about having to spend 11 dollars for a pair if we managed to find one. The worst of this forthcoming eclipse has been rediscovering the existence of a disco remix of Bonnie Tyler’s epic anthem “Total Eclipse of the Heart.” But there I was experiencing it from the lip syncing lips of a TV reporter bound for the Path of Totality. That may well be part of the sour grapes experience of seeing Facebook posts from people with job tasks that involve traveling to optimal places to experience the eclipse. One recent afternoon heading out of the grocery store I saw, from the corner of my eye, a display of souvenir cups emblazoned with the phrase “Great American Eclipse.” I was annoyed with this marketing of a natural phenomenon. I didn’t even think to take a picture, I was too busy fleeing. Days later the display had been moved. It helped a bit when someone pointed out that the marketers were probably going to lose their shirts trying to sell dumb merchandise. One local TV channel is calling the event something generic like Total Solar Eclipse 2017 so “Great American Eclipse,” is, at least, on the exciting side. 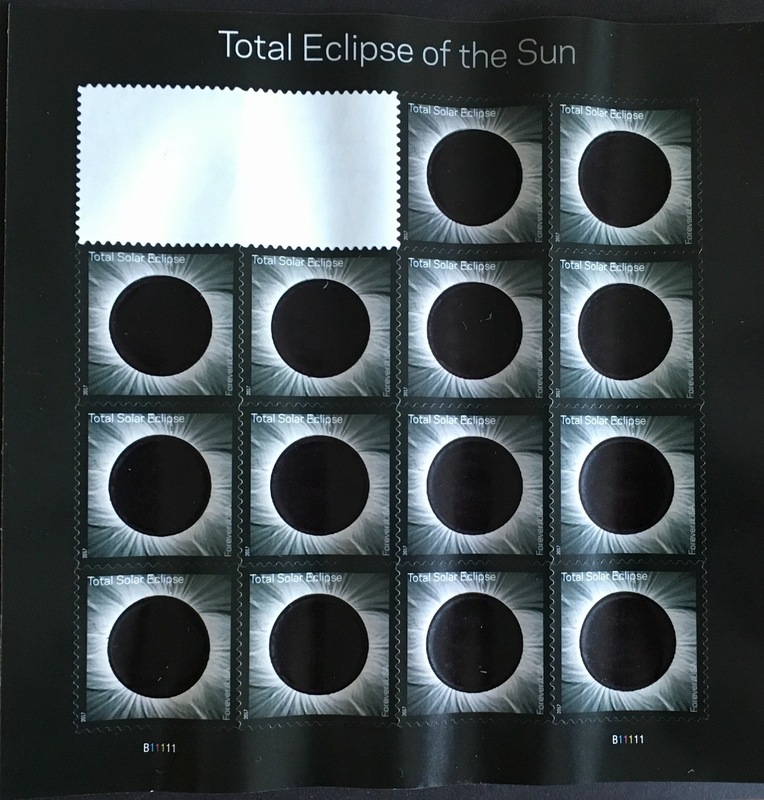 Heat sensitive eclipse stamps from the US Post Office. This hoopla serves a purpose. 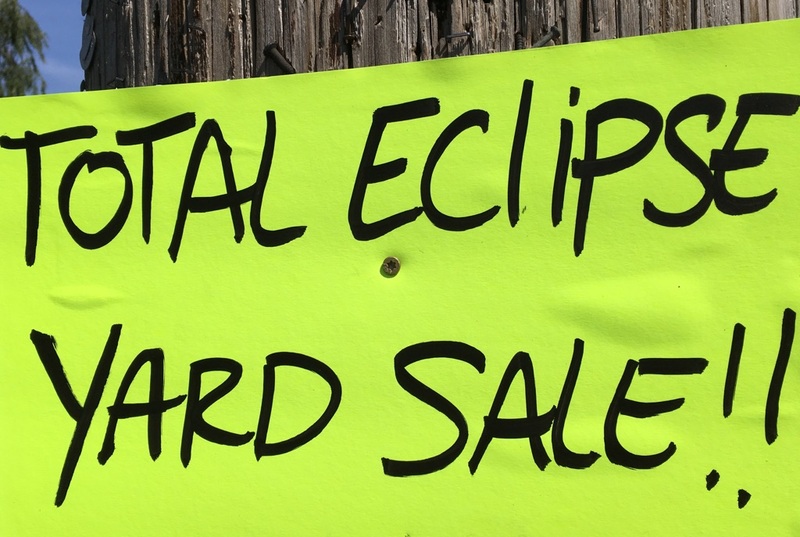 It gets the word out that the sun will temporarily be blocked out. This way, everyone around the world will not freak out, but instead just accept it since they have had ample, to the point of ad nauseam, advance notice. 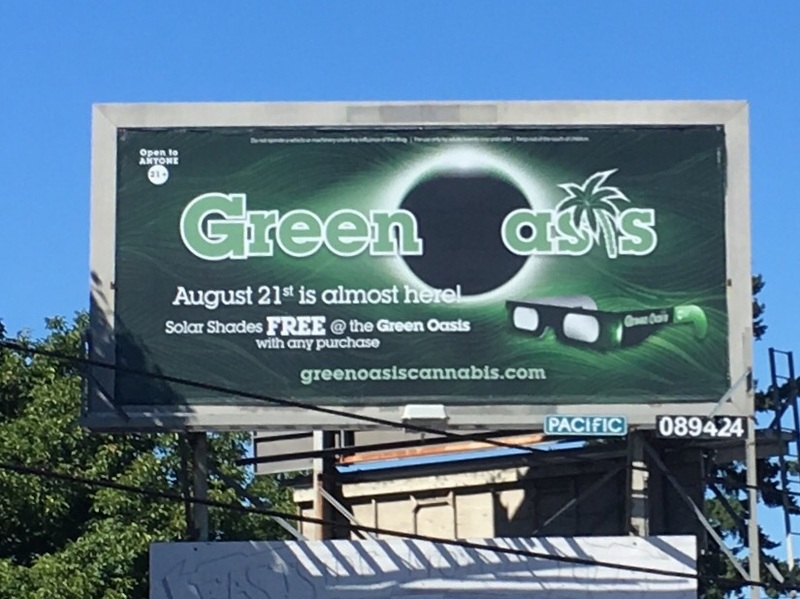 On a promo for a local radio show, OPB’s State of Wonder, which devoted a whole episode to eclipse coverage, I heard a man discussing the event. I’m paraphrasing but it sounded like he was saying the two-minute event would change people during those two minutes, possibly for all time. I will be sure to let you know how the eclipse changes me in part two of this post to run later in the week. Box it up and sell it. Editor’s note: The Portland Orbit has no qualms with the use of unnamed sources probably because we’re not always sure what their names are to begin with. Thanks goes to Will Simmons who said “you gotta write about the eclipse,” and Allen Callaci who suggested a two-part post, a kind of aftermath/after geometry type thing. the eclipse got rained out in DC. You just had to be in the Path of Totality. You’ll find out why very soon. But man I would have been saying don’t rain on my eclipse.